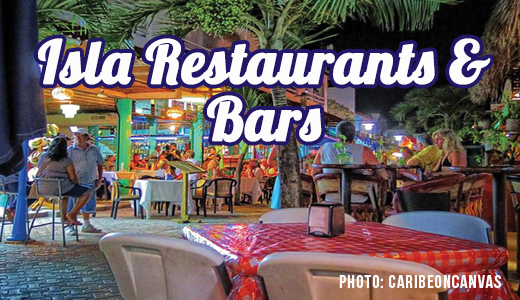 are mostly located downtown but there are definitely some great restaurants out in the colonias and by the airport strip serving tasty food and drinks as well. You will find everything from taqueria’s, bars, lounges, nightclubs to a fine dining seaside restaurant. Isla Mujeres Bar serving 2×1 tequila shots. Av. Hidalgo, North of Matamoros next to Fayne’s Grill and Restaurant. Mexican Loncheria located downtown at the mercado near North Beach. Asian cuisine. Located towards the north end of Hidalgo. Beautiful restaurant located directly on North Beach with the best sunset of the island. Bistro Francais Restaurant is located downtown on Av. Matamoros 29, entre Juarez and Hildago. Black Cat BBQ & Seafood Grill is a restaurant that brings gourmet BBQ to the island. A great restaurant and bar serving a variety of menu items including burgers, fish and chips, wings, chicken fingers, caesar salad and more. Located on Av. Matamoros. Buho’s Restaurant & Bar is located at North Beach Isla Mujeres. Located across from the ferry. Cafe Cito serves breakfast and is located downtown Isla Mujeres on Av. Matamoros. Cafe del Mar is a beach club, restaurant and great place for your Isla Mujeres Wedding. Cafe del Mar is located downtown Isla Mujeres at Ave Adolfo Lopez / Privilege Aluxes Hotel / North Beach Isla Mujeres. Cafe Mogagua is located downtown on the corner of Abasolo and Juarez. Located at the corner of Guerrero & Matamoros. Serving delicious crepes, paninis, pastas, lasagna’s and much more! Capitan Dulche Beach Club is located on South Point, north of Garrafon. Located near the church of Guadalupe. One of the island’s most romantic and beautiful settings, ComoNo is a rooftop terrace restaurant located on top of our sister restaurant el Patio which is Hidalgo’s only sand floor restaurant with a beautiful garden courtyard and groovy lounge. Churros are made with sugar and filled with your favorite filling. Choose from strawberry, chocolate, cream cheese, vanilla, nutella, caramel and lechera (sweet milk). Isla Mujeres Restaurant Roof top Dinning and Ocean view Terrace with Italian dishes of Pasta, Seafood and Meat. Breakfast and Lunch: Mexican & International, Dinner: Italian & Mediterranean Da Luisa Rooftop Dining is located at Hotel Casa Ixchel, Caribbean Side (open sea) of Isla Mujeres, about 1/2 kilometer south of the airstrip. Don Chepo’s Mexican Restaurant is located downtown on Av. Hidalgo between Madero and Abasolo. This Isla Mujeres restaurant and bar is situated on Hidalgo Avenue, Isla’s main street, Fayne’s offers a relaxed and friendly environment to listen to live guitar music during your dinner. The evening’s party begins at 10:30pm with The Band with No Name, the best of American and Latino music as well as Caribbean rhythms. Fenix is a modern, oceanfront lounge located on the sparkling waters of North Beach. Fredy’s is a Mexican restaurant located downtown on Av. Hidalgo. Sandwiches, Baguettes and delicious typical Mexican food. Greenverde is close to Chedraui, north on the opposite side of the road. Hostaria Ristorante is owned and run by a lovely Italian couple who put as much love into their food as taste! Serving excellent pizzas, fried specialities and of course delicious pasta. Open for breakfast, lunch and dinner. Located at the corner of Abasolo and Hidalgo. Isla Brewing Company creates craft beers with Caribbean flair. Good simple breakfast, yummy simple tapas, ice cold drinks, awesome live music, friendly faces that make you want to come back again and again. 100% Mexican food restaurant located at Hidalgo & Francisco I. Madero ( Ex Sombrero de Gomar ). For over 17 years this Isla Mujeres Restaurant has been delighting tourists and locals alike with traditional Mexican & American style dishes. We are proud to serve you healthy, delicious breakfasts & lunches using fresh, natural, regional ingredients. La Lomita Mexican Restaurant is located just outside of downtown Isla Mujeres on Av Juarez. One of Isla Mujeres‘ newest restaurants: Lola Valentina’s, featuring a delicious Caribbean Seafood menu. Explore the tastes of Mexican-Caribbean Cuisine with creative interpretations of local & seasonal ingredients. Some favorites include our Tamarind Sea Bass on Coconut Rice, Picadillo stuffed Jalapeño Poppers, and our Pineapple Adobo Shrimp. Experience our world famous dishes and the new creations in our menu! Join Polo and find out why Mango is the one, the only and the best. Phone: 274 0118 or Cell: 998 223 8906 Located in the Colonia Meteorologico / Across from the Guadalupe Church. Serving Mexican Specialities. Located on Abasolo. Me Latte Chocolate is a small cafe and deli with pastries, paninis, fresh salads, sweet treats, smoothies, juices and so much more! Mexican Restaurant and Lounge located downtown on Av. Abasolo. Restaurant and bar with excellent fresh seafood and Mexican food. Enjoy sitting under our traditional palapa while enjoying the game or have a good time with friends. We serve excellent Margaritas and cold beer. Seafood and steaks. Located on Rueda Medina. Nico’s Restaurant is located at Isla 33 Villas on the Caribbean side of the island. Delicous flavours of homemade Italian gelato. Mexican Food with Pizzas and Pastas. Great location for weddings and the famous tikin chik fish! Playa Mexico is a Beach Club located on Sac Bajo that is also available for Isla Mujeres Weddings. Mexican Restaurant in downtown on Avenida Juarez and Avenida Abasolo. Restaurant downtown Isla Mujeres with delicious home-made Mexican food by the one and only Ruben! Restaurant downtown Isla Mujeres on Av. Hidalgo. Homemade Italian and Mexican Food. Located on Av. Hidalgo near the Super Xpress. Sunset Grill is located directly on Isla Mujeres’ best beach, the famous Playa Norte. Their varied menu has a complete selection of international cuisine, the best seafood, Mexican specialties, & the delicious creations by our renowned chef. As a patron of our restaurant, you will enjoy our beautiful palapa & the comfort of the beach. Tacos Cachirul is located at the south east end of Salina Grande, Las Colonias. YA MON! CARIBBEAN FOOD & FUN ON ISLA MUJERES Its only 934 kilometers from Isla to Negril but you don’t have to swim that far for the great taste of the Caribbean! Conveniently located just across the road from the Garrafon Natural Reef Park at the south end of Isla Mujeres. Another local Isla Mujeres Bar with great drink, friendly bartenders and dj sets.